Here we go folks. We're about to fall just a tad bit further down the rabbit hole. The information for this comes from the Huffington Post (I know...pick your jaw off the floor.). I occasionally stop over there to see just how successful we conservatives/libertarians are by how much whining goes on over there. In the midst of this economic crisis created by the left, it appears that a Republican House member from Michigan (Is there really such a creature?) has introduced a tax credit for the American people. The tax credit could give Americans up to $3500 in savings on their returns. The catch? It's a tax credit for expenses spent on YOUR PETS. That's right. Spot and Fido could potentially get you a tax break. Rep. Thaddeus McCotter (R-MI) has sent out a letter to fellow House members asking for co-sponsors on his Humanity and Pets Partnered Through the Years Act (HAPPY) which would give taxpayers up to $3500 in tax credits for pet care, including vet visits. "Dear Colleague," the letter reads. "According to the 2007-2008 National Pet Owners Survey, 63% of United States households own a pet. Indeed, the human-animal bond has been shown to have a positive effect upon people's emotional and physical well being. In families with children, pets help to create a nurturing environment and provide ample educational opportunities. For people in later stages of life, pets offer important companionship. No matter the age of the owner, pets have been shown to reduce stress, safeguard against depression, improve social skills, and even ease loss. "In light of this, please join me in becoming a cosponsor to H.R. 3501, the Humanity and Pets Partnered Through the Years (HAPPY) Act. If enacted, H.R. 3501 would amend the Internal Revenue Code (IRC) to allow an annual tax deduction of up to $3500 for qualified pet care expenses. Specifically, "qualified pet care expenses" would be defined as funds spent in connection with providing care (including veterinary care) for a legally owned, domesticated animal." Now, don't get me wrong. I love my pets. But instead of giving more of a tax break to help pay for healthcare expenses for humans, Mr. McCotter has gotten this so upside-down that it boggles my mind. Right now, the IRS allows a taxpayer to deduct medical and dental expenses that exceed 7.5% of their adjusted gross income. If you spend less than that, you can't deduct your medical expenses. But you can sure deduct expenses for the care of your pet under this legislation! Am I the only one who has an issue with this lunacy? McCotter introduced this legislation in late July and has yet to garner any co-sponsors. Thank Heaven! 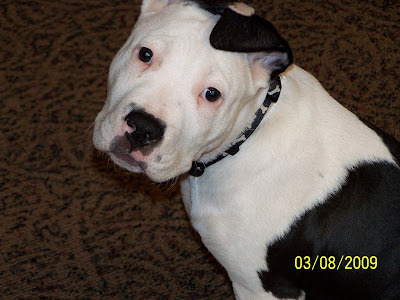 Btw...the picture at the top of this post is my beloved pit bull, Zeus. I like McCotter - he's on Red Eye every so often and he seems quite respectful and intelligent. Very anti-Pelosi, if you know what I mean. I see your point about this bill, but honesty, I have to wonder if he didn't put this forward as some kind of sarcastic jab at the Dem leadership. That's the kind of guy he seems to be. If that's not the case, then I quickly am losing respect for a rep I thought I had respect for. Soloman: I hope this is all just a joke. I don't know that much about McCotter, but anyone anti-Pelosi can't be all bad. I will be signing up my fish! I don't have doggies anymore. Only the libs could think of something so silly! But, I love animals, so it could be worse! I've been playing around redesigning my blog all day, I'm behind on my comments! Bunni: Gravel, tank cleaners, decorations...all deductible under this plan!